Thursday participants on the 5-day trip started their trek into Rubicon Springs from Georgetown, California. Rock Rollers were stationed in all the right places to help assist participants through the difficult spots. Upon arriving at Buck Island, most got a complimentary cool off by sneaky water gunners in the bushes and any mechanical help that was necessary to continue on the trail to main camp. 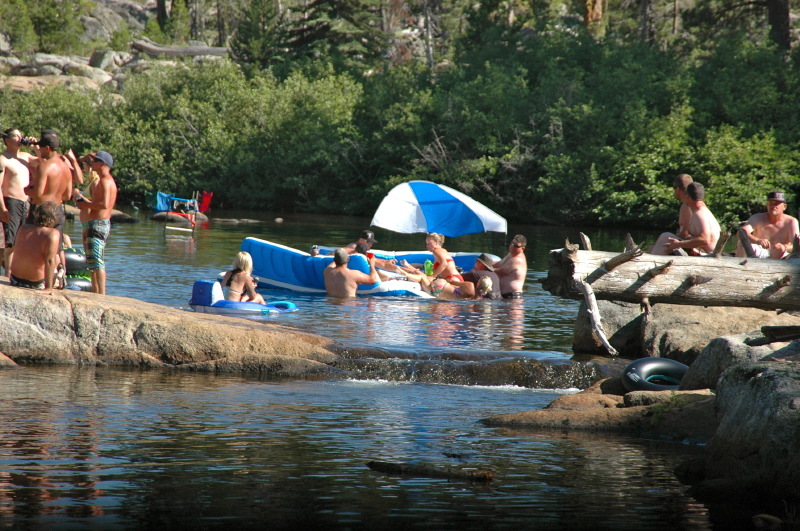 The Rubicon Springs area was buzzing with tents being set up and camps establishing their stake hold for the weekend. The pasta and salad dinner with a big screen showing old Jeepers Jamboree movies capped off a great day of 4×4 wheeling. Friday brought more participants into camp for the 4-day trip. Geologist George Wheeldon gave a very informative talk on the formation of rocks and mining possibilities in the area. Most relaxed in the river and enjoyed friendships formed throughout the years and came to main camp ready to purchase the limited edition 60th Anniversary shirts, sweatshirts and hats. Friday night dinner of Pork Loin was serenaded by Papa Blues and followed up with a raffle consisting of thousands of dollars in raffle prizes compliments of the industry sponsors. The Georgetown Rotary Club Ice Cream Parlor was open all weekend benefiting the local high schools. Country music group Whiskey Dawn rocked the night away and kept the dance floor full. Saturday was packed with things to do. Starting the day with a huge and filling breakfast, guests had the opportunity to visit with all the vendors that helped support the Jeepers Jamboree in the form of a vendor show. Just up the hill was the resurrection of Flatville where 22 flat fenders converged into a show’n’shine competition. Congratulations to Mike Maloney who won in his WFO Army painted Flatty. 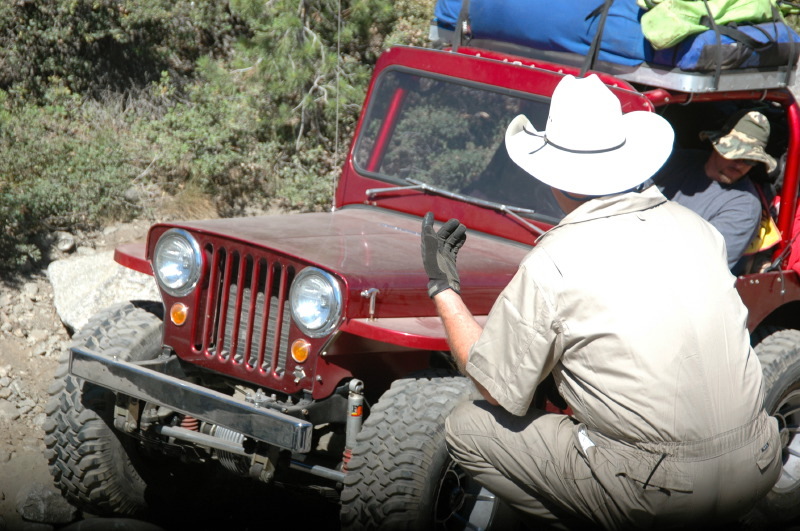 Also in the morning, Steve Morris who has been on the Jeepers Jamboree since its second trip in 1954 gave the history lesson of Jeepers Jamboree and the trail. Needless to say, there were many intent listeners to all of his stories. After lunch, the Rubicon Trail Foundation sold out their fundraising wine tasting event that featured over 8 wineries, a selection of snacks and a one-of-a-kind souvenir 60th Anniversary Wine glass. Congratulations to Patty Peters who won a signature bottle of wine. Papa Blues again serenaded the steak dinner, but before Whiskey Dawn hit the stage there was business to tend to. Thousands of dollars in raffle prizes were given away again and then it was time to give away the 60th Anniversary Jeep. Everyone listening intently, it got a little nerve racking as Bob Sweeney called out the numbers one-by-one. 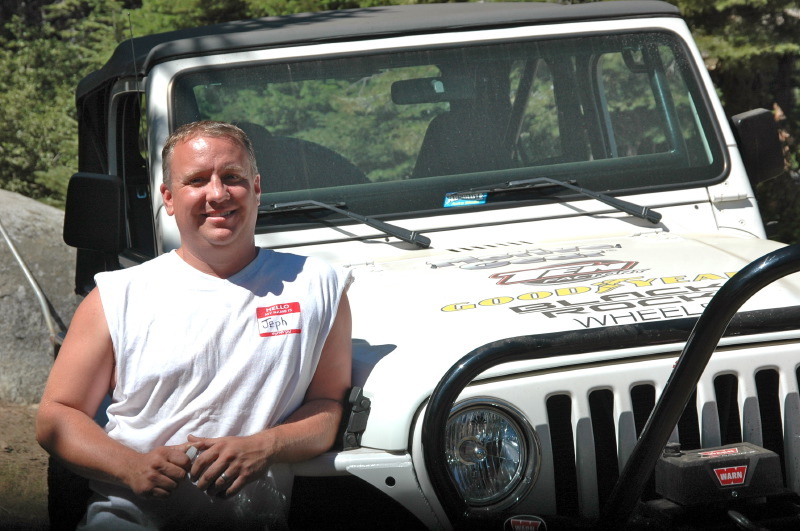 Congratulations to Jeff Saari from Reno, Nevada who won the Jeep sponsored by 4 Wheel Parts, SmittyBilt, Currie Enterprises, GenRight Off Road, Black Rock, Ten-Factory, Motive Gear, Goodyear, Arabia’s Overkill, J&W Autowreckers, Roundeye.com, RockHard and Eagle Radiator. Sunday, typically when the day 4-day trip guests leave, had a different momentum to it. With an unfortunate accident Saturday afternoon resulting in a fire blocking the exit on Cadillac Hill, guests were asked to stay another day. Most appreciated the opportunity to enjoy another day on the river and others opted to exit back through Loon Lake. Guests continued to be catered and had another great night of food and music while the Forest Service was allowed to diligently work on extinguishing the fire. “We would like to extend a loud thank you to everybody for supporting Jeepers Jamboree and working with us. We appreciate you staying with us the extra day and making the exit on Monday go as smooth as it did,” said Bob Sweeney. Monday guests grabbed their breakfast burritos and were lined up to exit on the Rubicon Trail towards South Lake Tahoe during the window of opportunity that the Forest Service allowed. “We really appreciate the Forest Service for not only acting quickly on this fire for the safety of the guests, but also for working with us on allowing our guests out of the Rubicon Springs on Monday,” said Dan DeWolf, President of Jeepers Jamboree. All guests and staff safely exited the area and were greeted just past observation point for one last warm lunch. After another day on the trail being helped by rock rollers, Jeepers Jamboree staff was at the exit point airing up tires to specified road levels for a safe return to their trailer or home. “Our events are a reflection of the Jeeping industry and we are glad to have important industry partners again this year,” said Bob Sweeney. Thank you to 4 Wheel Parts, G2 Axle & Gear, Currie Enterprises, FishMouth, GenRight Off Road, MetalCloak, NorCal Rock Racing, Olympic 4×4, OilTek Solutions, OR-Fab, Paramount Off Road, Performance Accessories, Poly Performance, Pro Comp, Roggy Enterprises, Rubicon Express, SmittyBilt, Synergy, Trail Master, WFO Concepts, Arabia’s Overkill, Black Rock, KMF Offroad, Parts Mike, Rock Hard, Savvy Offroad and Varozza 4×4.